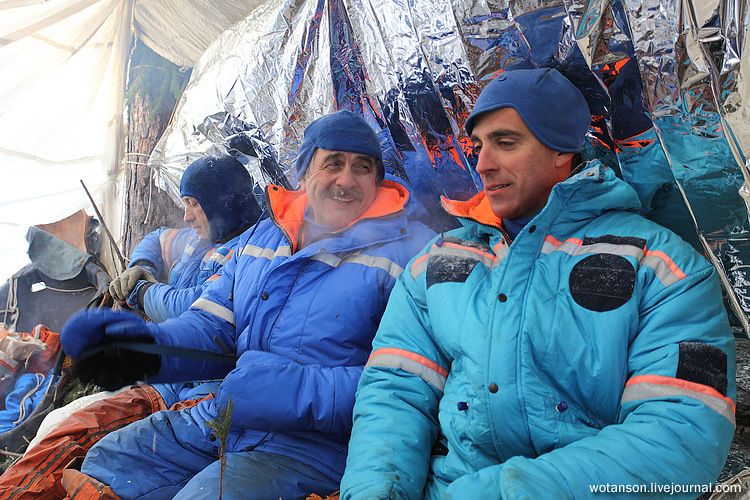 Russian cosmonauts Alexander Misurkin, Pavel Vinogradov and NASA astronaut John Cassidy. It’s been two days since they began another exercise in the Yu. A. Gagarin State Scientific Research-and-Testing Cosmonaut Training Center. 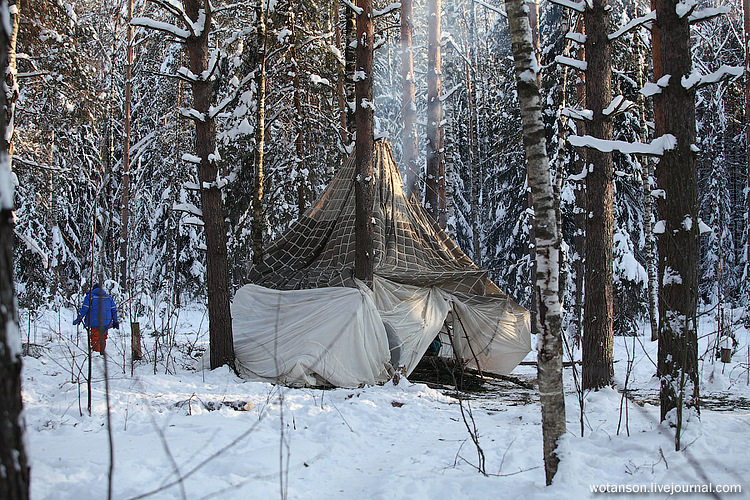 The purpose of this exercise is to provide cosmonauts with necessary knowledge and skills to stay alive in case their capsule lands in a wrong place, somewhere in a woodland for example. Hero of Russia Pavel Vinogradov has been in space twice. 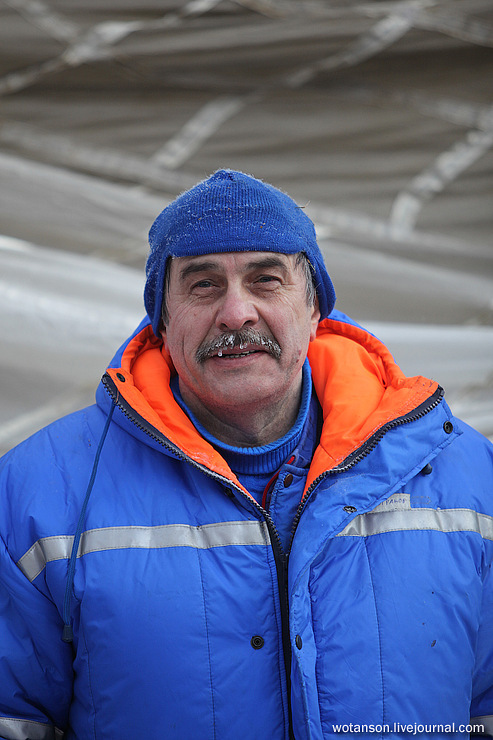 In April, 2013 Alexander Missurkin is going to have his first flight into space. John Cassidy has been in space once. 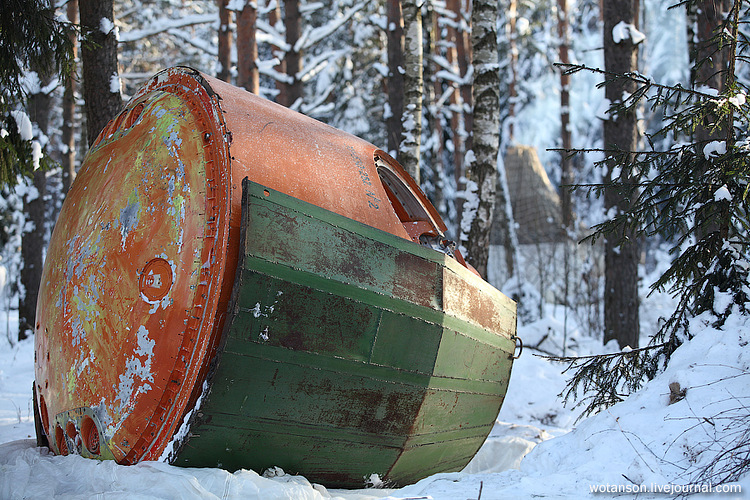 They started practicing these exercises in 1965 after two Russian cosmonauts made a landing in taiga and it took the rescue group three days to get to them. 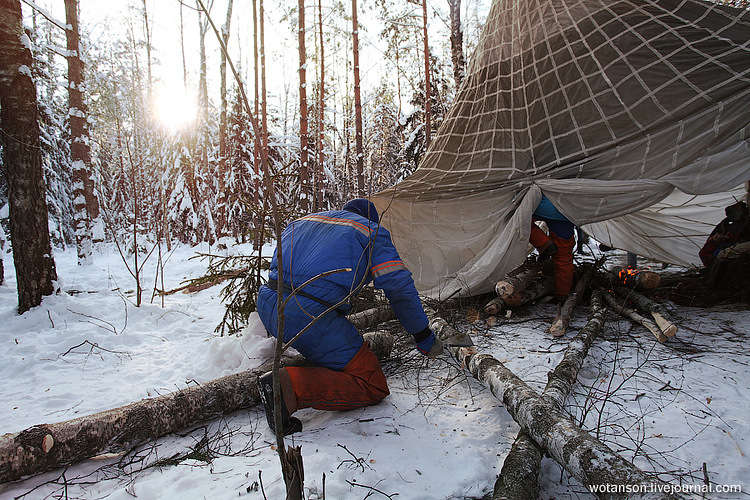 According to their instructions, the cosmonauts have to pitch a tent, make a fire and mark their location with signal bullets. 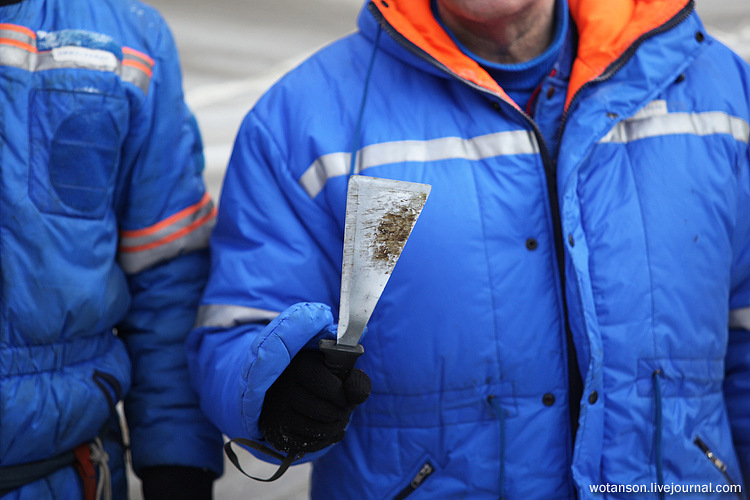 With this machete, they can cut trees! 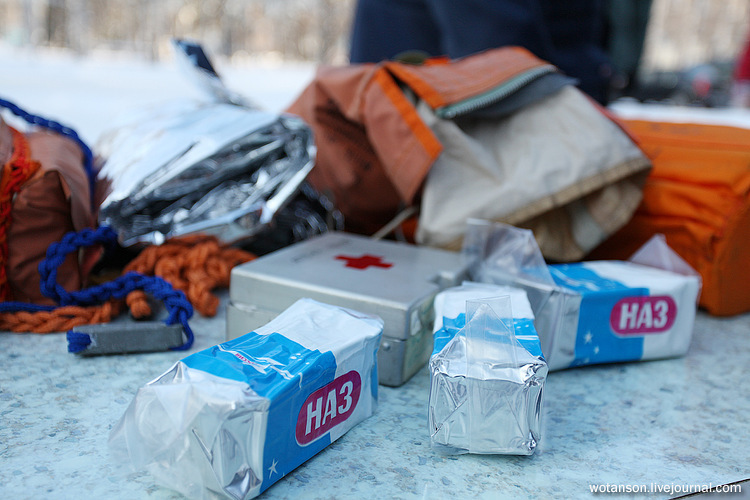 This food, water and medicines are exactly the same as the food, water and medicines cosmonauts have in their capsules. 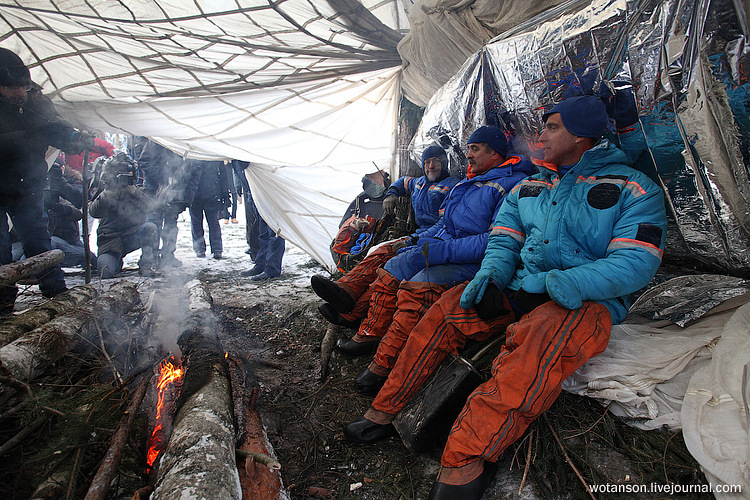 Cosmonauts are supposed to be able to wait for the rescue group for two days at a temperature of -50C to +50C. A short press conference in their tent. 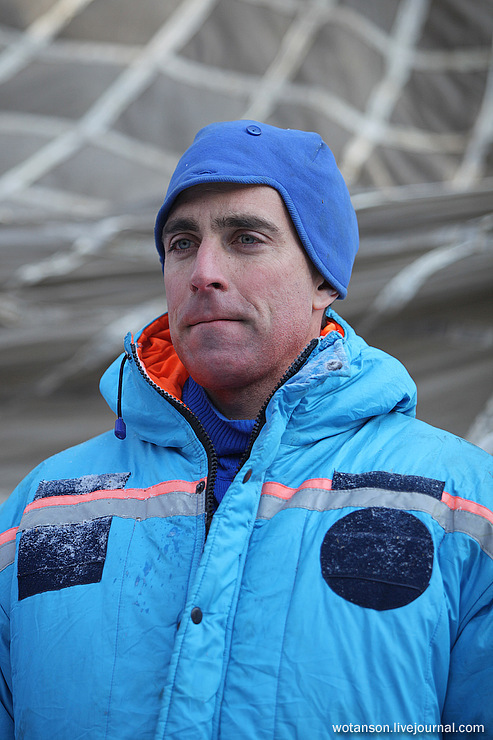 Althouhg the exercise may seem to be easy, in fact it takes the crew a lot of efforts and nerves. By the end of the second day, they are weak both physically and emotionally. 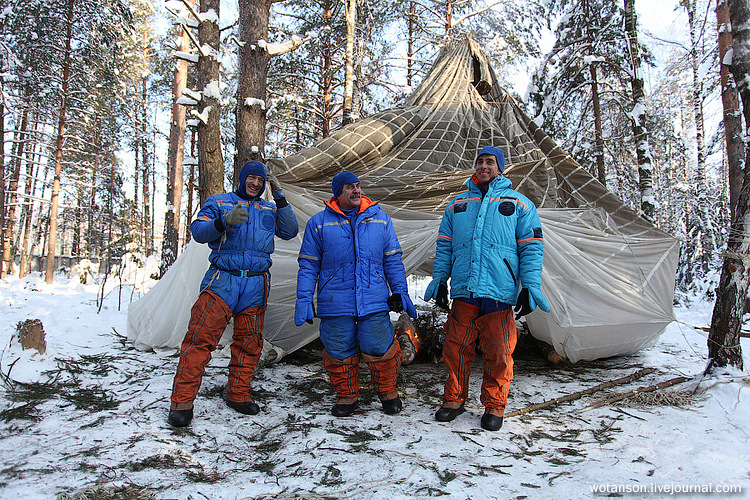 Given the adaptation after the weightlessness they experience before their landing, it is hard to imagine how difficult it must be for them to set up an emergency camp like this. Yeah, I was going to say, most of these people can’t even walk after touching down, how are they going to expect them to cut down trees (with that little thing) and set up a camp! That’s insane. Cosmonauts! That´s the correct term lads! Keep it up and the anglo-american rubbish out! Reminds me of the last Motel8 I stayed at.